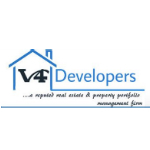 Since its commencement in the year 2007,V4 Developers has shown a great period of growth and expansion.We attribute our success to the sheer hard-work, dedication and talent of everyone involved. Our work here is extremely dynamic and each day is filled with newer challenges and attaining newer goals. We are continuously learning to accumulate skills and knowledge which not only helps in adding value to our individual growth but also to the organization. V4 Developers provides a great workplace where employees work as a team congenially, encouraging one another to tap into their true potential, turn their ideas into reality and make a real impact.Every contribution made, little or big, will be recognized and appreciated.